Dabblingmomma: Nominated for Liebster Award! I am fairly new to the blogging world so when I received notification from Angel at The Loving House of Mama Casale I was flattered! 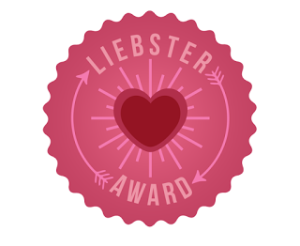 Since I was not sure of what the Liebster Award was all about I did a quick Google check and learned that it's a cyber award given from one blogger to another. The way I understand it is I answer 11 questions chosen for me, in this case from Angel and then I pass on 11 questions to 11 other bloggers that I nominate for the award. I look at it as a great way to learn about other people and their blogs! My hope for other bloggers is that they can continue to network themselves and learn from others and my hope for my readers is to find other sites that they can also go to and learn from! Before moving on I wanted to give another shout out to Angel at The Loving House of Mama Casale for taking the time to recognize my blog and to include me in her nominations! Angel has a great site with lots of fun and creative ideas! If you have little ones, which if you're reading my blog I'm sure you do, then you'll want to head over to see what Angel has been up to! One more thing before moving on...I realize that this can be a bit time consuming so if for whatever reason any of the nominees choose not to partake, that's totally ok and completely understandable! At the very least know that you have left an impression on me in some way, enough so that I wanted to acknowledge you all!! Each person must post 11 things about themselves by answering the questions that the nominator has set for you. Create 11 questions for the people you’ve nominated to answer. Choose 11 people (with less than 200 followers) and link to them in your post. Go to their page and let them know! 1. What is the inspiration behind your blog title? I feel that I 'dabble' in a little bit of everything. 2. Why did you start to blog? As a way to document the things I do with my children and to share with others so that they can share with their children. 3. What is a goal you have for your blog? Since I'm a Stay At Home Mom I would love to be able to earn some income from my blog, eventually. Although that is only icing on the cake. I simply enjoy blogging to share ideas. 4. What is your favorite activity to do with your family? Anything outdoors whether riding bikes, taking a walk or playing in the yard. 5. What is one of your favorite quotes? It is what it is. 7. What is your favorite food? I'm a sucker when it comes to cookies! Especially chocolate chip! 8. Which of your blogs post is your favorite? Learning about Seasons post. My daughter had a ton of fun with it! 9. If you could witness any event past, present or future, what would it be? My children's weddings! 10. What story does your family always tell about you? How quiet I was as a little girl. 11. What do you do on your free time? Blog, of course! Now here are the 11 Bloggers that I would like to nominate! I have most likely come across your blog through link parties and have been intrigued by your blog or else I wouldn't have stopped by in the first place! I love what I learn from all of your creative minds, so thank YOU! 3. If you could play any sport which would it be? 4. What is your favorite topic to blog about? 6. Name one thing on your bucket list, if you have one? 7. If you could choose to have dinner with anyone who would it be? 9. Do you prefer ice-cream or frozen yogurt? Thanks for the nomination... so sweet of you. Thank you Susen for the nomination! I am currently working on this post and will link back to you. You picked some great questions and I hope that I can come up with some good ones. This made my day. Thanks Susen for your lovely nomination! Will try to find some time during the coming holidays to answer your questions.